The Craftsbury Outdoor Center is an inspiring place to experience the great outdoors. A year-round destination on 400 acres, this non-profit specializes in exciting outdoor activities for the whole family. The winter season is magical in Craftsbury, and we offer our guests more than just world-class cross-country skiing. 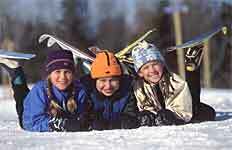 Choose from snowshoeing, orienteering, iceskating, backcountry tours, animal tracking, nature studies, yoga and more. We also have certified massage therapists, a sauna and a fitness room. Accommodations for 90 guests in private cottages and comfortable lodges. Babysitting can be arranged with advance notice. Our daily goal is to deliver the most skiing possible, groomed to the highest standard we can. We have three PistenBully groomers, as well as a selection of snow machines at our disposal - plus a collection of snow-farming implements. In general, trails are groomed and tracked by mid-morning, though that can be pushed back during days of heavy snow or under other circumstances. Unless otherwise noted, always assume groomed also implies tracked. Average Base Depth: 10 - 17 1/4"